Objective Smoking usually develops in adolescence and is patterned by socioeconomic position (SEP). We examined whether early adolescent smoking development and associations with SEP have changed over time in a population with well-developed tobacco control policies. We additionally investigated the relative importance of socioeconomic inequalities at different stages of smoking development. Methods An annual UK rotating panel survey including data from 5122 adolescents (51% male) aged 11–15 years between 1994 and 2008. Rates of smoking initiation, progression to occasional smoking (experimentation), progression to daily smoking (escalation), and quitting were examined using discrete-time event history analysis. Results Initiation, experimentation and escalation rates declined over the study period while quitting rates increased. Decreases in initiation were concentrated among older adolescents and decreases in escalation among those who spent a year or two as occasional smokers. Socioeconomic disadvantage was associated with higher rates of initiation and escalation, with similar findings across SEP measures. Inequalities in initiation were stronger at younger ages. There was less evidence of associations between SEP and quitting or experimentation. Inequalities in escalation remained constant over time, while inequalities in initiation widened before narrowing. Further modelling suggested that differential initiation rates contributed more to inequalities in daily smoking at age 15 than did differential escalation. Conclusions Increasing tobacco control in the UK is associated with reduced uptake and more quitting in early adolescence, but socioeconomic inequalities remain. Interventions should focus on reducing inequalities in initiation among early adolescents. Development of smoking behaviour can be conceptualised in stages10 (figure 1), with less than certain probability of advancing between stages. Initiation represents a transition from never-smoker to having smoked once or twice. Experimentation represents progression to occasional, but less than daily, use. Escalation represents a transition from occasional smoking to regular, daily use and quitting an alternative transition from occasional smoking to non-smoking. Although further transitions are possible after quitting or progressing to daily smoking (eg, relapse and escalation after quitting or quitting after daily smoking), this paper focuses on risks associated with reaching the critical stage of daily smoking. Socioeconomic position (SEP) may not be equally important at all transitions.10 ,11 Understanding how socioeconomic patterning differs between early smoking transitions could help identify intervention points for reducing inequalities in smoking and its sequelae. Smoking stages for early adolescents. Smoking status prevalence among 15-year-olds (1994–2008) and tobacco control developments (1990–2012). It is unclear whether or how such changes have impacted on early adolescent smoking. Younger adolescents tend to be less likely to obtain cigarettes commercially,17 so policies affecting cigarette purchase may be less relevant for them. Indeed, older (17–18 years) adolescents tend to be more sensitive to price increases.18 There is little evidence on how TC policies influence the socioeconomic patterning of adolescent smoking,2 ,18 and it is unclear how SEP may affect early adolescent smoking development in a country with advanced TC measures. Did the risk for each smoking transition in early adolescence change between 1994 and 2008? Was the risk for each smoking transition associated with SEP? Did associations between smoking transition rates and SEP in early adolescence change between 1994 and 2008? Which transitions contributed most to socioeconomic inequalities in daily smoking in mid-adolescence over this period? The British Youth Panel (BYP) was a rotating panel of 11–15-year-olds living within households in the British Household Panel Survey (BHPS).19 The first wave was in 1994, with respondents added each year as new cohorts of children within BHPS households turned 11, or as BHPS adults moved into new households with 11–15-year-olds. Youth were interviewed annually and exited the BYP as they reached age 16, or as they or their household dropped out. Data here extend up to 2008 (when the survey was merged into the larger UK Household Longitudinal Survey). Booster samples of Scottish and Welsh households were added in 2000 and from Northern Ireland in 2004. Children within those households were included/excluded at appropriate ages from then on. In total, 5122 adolescents were interviewed at least once. The representativeness of the BHPS sample has been described in detail elsewhere,20 but individuals of disadvantaged SEP were somewhat less likely to be retained, meaning their children may be under-represented at later dates. Respondents reported their current smoking status annually. Year-by-year histories from ages 11–15 (inclusive) were created for each respondent, coding them at each year as either never-smokers, having tried smoking once or twice, occasional smokers, daily smokers or ex-smokers. Retrospective data on initiation were used to fill some gaps in the prospective histories (further details are available from the author). SEP was measured as parental education based on the highest qualification (of either parent) as reported by adult household members at first observation: degree or postgraduate qualifications; other qualifications; or none. Other indicators of SEP were also considered: parental social class using the UK Registrar General's social class schema (I and II, III, or IV and V); income (equivalised, inflation adjusted and split into tertiles based on the distribution within each year); housing tenure (owned or mortgaged vs rented or other); and parental employment status (an employed parent vs neither parent employed). Since results from different SEP indicators were generally consistent, results are presented for parental education only; any inconsistencies in findings from other measures are noted in the text. Given the multifaceted TC changes within the UK, many occurring simultaneously or within short periods of time (see figure 2), and the possibility that many may have had interactive effects, isolating the effects of particular TC policies may be difficult.2 ,21 It may nevertheless be valuable to examine time trends in smoking development over the period in which these policies were introduced. This was carried out by including a variable for the time period, representing the year in which each interview took place (reference value: 2001). Allowing non-linear effects of the period recognises that time trends may not be uniform across the study. Gender was coded 0 (males) and 1 (females). Age was measured in years (reference value: age 11), and separated for later transition stages into age at prior transition (reference value: 11) and years since prior transition (reference value: 0). Dummy variables for country (reference category: England) were also included since booster samples from Scotland, Wales and Northern Ireland were included at different times, and may have biased the period effects. Discrete-time event history analysis with time coded in years was used to examine associations between covariates and odds of transitions between smoking stages. All analyses were performed in Mplus 7.22 Three separate analyses were performed to investigate initiation (including all respondents), experimentation (including only those who initiated), and escalation or quitting (only occasional smokers). Escalation and quitting were treated as alternative outcomes in the third analysis, with occasional smoking as the reference category. For experimentation, escalation or quitting respondents were only included after making the prior transition, to avoid conflating predictors for the different transition stages.11 Respondents who skipped stages were coded as making the intervening transitions within the same year. Those who went from never smoking in 1 year to ex-smoking in the next year were assumed to have reached the stage of occasional but not daily smoking prior to quitting. Forty-one cases who retrospectively reported initiation prior to age 11 were coded as initiating at age 11. Missing data were addressed using multiple imputation (20 imputations). Missing data in smoking histories (which left the transition timing ambiguous) occurred where respondents either dropped out or missed waves, or were sampled towards the beginning or end of the observation period (eg, 11-year-olds in 2008 and 15-year-olds in 1994 were missing four waves of data). Missing covariates and smoking status at each year of age were imputed using an unrestricted two-level variance–covariance model of all variables. Person-years (n=25 610 with 32.7% having some missing data) were nested within individuals (n=5122). Parental absence and parental smoking within the household were also included in the imputation model. An 11-year-old in 2008 had values imputed up to 2012, and a 15-year-old in 1994 had values imputed back to 1990. This helps overcome bias in the period effects due to non-random missingness towards the beginning and end of the study period. Censoring of the data for discrete-time event history analysis was performed post-imputation. Analyses were performed on the imputed data sets and averaged results are presented. Sensitivity analyses were performed on those person-years for which complete data were available back to age 11 (13 809 person-years from 4059 individuals). All models included gender, country, parental education and period. The model of initiation included age; those for experimentation, escalation and quitting included age at prior transition and years since prior transition (ie, number of years at risk). All two-way interactions and a quadratic term for period were tested and retained if significant at the p<0.05 level. Results are presented as ORs and predicted probabilities. Both refer to the risk of a smoking transition occurring within a given year among those who had not already made that transition but had made prior transitions. The predicted probabilities were calculated using reference values except as otherwise specified. Additional calculations gauged the relative importance of inequalities at different transition stages in terms of progression to daily smoking by age 15. The predicted yearly transition probabilities from ages 11–15 were used to calculate the expected proportions of daily smokers by age 15 in two groups (parents with a degree or higher vs parents with no qualifications). Calculations were repeated after manipulating specific transition probabilities in the disadvantaged group to equal those in the advantaged group. This shows the effects of particular transitions on the expected difference between the groups in the proportion of daily smokers by age 15. Calculations were performed separately for males and females and for two time periods 10 years apart (1995–1999 and 2005–2009) to see if results were consistent. Figure 2 displays observed rates of ever smoking and current daily smoking among 15-year-olds by parental education, together with dates of important developments in UK TC. Smoking prevalence among 15-year-olds, while fairly stochastic, shows an overall pattern of decline as TC measures accumulate over the study period. Inequalities appear to be present throughout. Online supplementary appendix table 1 displays descriptive statistics, comparing the observed sample to the imputed data. The imputed data tended to have higher rates of smoking transitions, indicating that prospective smokers may have been more likely to drop out. Table 1 shows ORs and 95% CIs from models for each transition. Figure 3 shows the predicted transition probabilities by year, gender and either age (for initiation) or years since prior transition. Figure 3A, B display initiation probabilities for males and females, respectively. All two-way interactions between age, gender and period were significant (p<0.05) for initiation. The risk of initiation rises with age throughout the study, but more for females than males. The risk increases through the 1990s (except for older males) and then decreases during the 2000s, with greater decreases among older than younger adolescents. Figure 3C, D show male and female probabilities for experimentation, with greater risks for females than males, and risks declining steadily from the late 1990s onwards (no interactions). The risk of escalating from occasional to daily smoking is shown in figure 3E, F. Here, there was an interaction between period and years since prior transition (p<0.05). In the 1990s, respondents who had spent a year or two as occasional smokers had higher risks of escalation than those in their first year of occasional smoking, but this difference declined over time, disappearing by the end of the study period. The immediate risk of escalation within the first year of occasional smoking increased during the 1990s before declining in the 2000s. Finally, figure 3G, H show that the chances of quitting after becoming an occasional smoker increased during the 1990s, with a downturn towards the end of the study period (no interactions). Predicted probabilities of smoking transitions by year. Figure 4 shows the probabilities for each transition by parental education and period (since there were no interactions between parental education and gender, figure 4 shows the probabilities for males only; online supplementary figure S1 in the online appendix shows equivalent results for females). For initiation, parental education interacted with age and period (p<0.05; social class differed here from other SEP measures interacting with age but not period). Figure 4A shows the interaction with period. Adolescents whose parents had fewer qualifications had greater risks of initiation than those with degree-level parents; these inequalities widened during the 1990s before converging as risk declined more generally during the 2000s (this convergence was in absolute terms; in relative terms, inequalities continued to widen during the 2000s). Inequalities in initiation narrowed with age with an OR of 3.82 (95% CI 2.84 to 5.14) at age 11 reducing to 1.34 (0.99 to 1.82) by age 15, comparing those whose parents had no qualifications to those whose parents had a degree or postgraduate education (age 15 OR not shown in table 1 but calculated from model coefficients). Predicted probabilities of smoking transitions by parental education and year (males). The risk of experimentation is shown in figure 4B and there was little difference by parental education. However, social class and tenure showed an association with the risk of experimentation, and the effect for social class was non-linear; respondents with parents in class III and in rented accommodation had the highest risk (results not shown). The risk of escalation from occasional to daily smoking was patterned by parental education with ORs of 2.19 (1.32 to 3.63) and 1.63 (1.10 to 2.41), respectively, for those whose parents had no or other qualifications compared with those whose parents had a degree or postgraduate education (figure 4C). 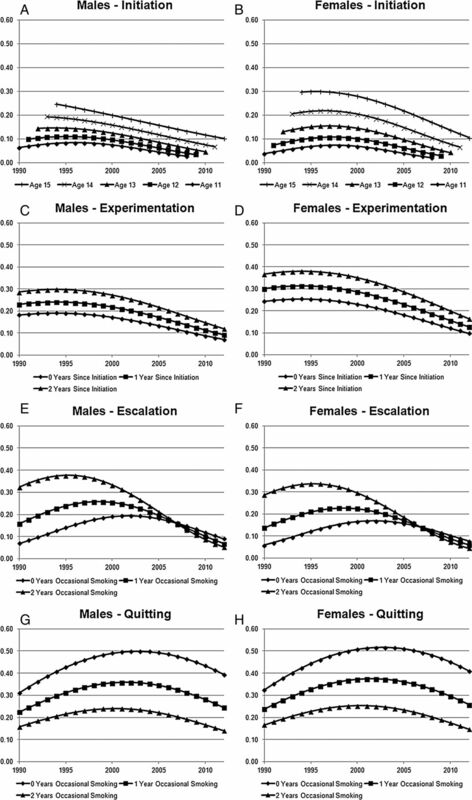 There were no significant associations between parental education and the odds of quitting as opposed to remaining an occasional smoker (figure 4D). Sensitivity analyses using person-years with complete data were broadly supportive of the patterns shown here, but for most measures of SEP socioeconomic disadvantage was associated with higher chances of experimentation and quitting. Online supplementary appendix table 2 shows how the expected inequalities in proportions reaching daily smoking by age 15 would reduce if inequalities in initiation and escalation were removed. The greatest reductions were achieved by removing inequalities in initiation rates, especially in recent years when the prevalence was lower (83–84% reductions in 2005–2009 compared with 72–76% in 1995–1999). However, since inequalities in initiation and escalation act synergistically, substantial reductions could be achieved by removing either (estimated reductions for removing inequalities in escalation were all over 50%). Removing inequalities at specific ages had the most impact between ages 11 and 13 for initiation, but at ages 14 and 15 for escalation (eg, for males in 2005–2009, there was an 11% reduction for removing inequalities in initiation at age 11 only, compared with a 4% reduction at age 15, while comparable figures for escalation were 1% at age 11 and 21% at age 15). This paper presents analyses of smoking development in adolescents aged 11–15 between 1994 and 2008 (with imputed/retrospective data expanding this to 1990–2012). Over this period, rates of initiation, experimentation and escalation decreased, while rates of quitting increased. Changes in initiation rates were concentrated among older adolescents, and changes in escalation rates among those who had spent a year or two as occasional smokers (thus tending to be older). Socioeconomic disadvantage was associated with higher initiation rates, particularly at younger ages, and with higher rates of escalation to daily smoking. There was less evidence of associations between SEP and experimentation or quitting, though associations were observed for some SEP measures and in sensitivity analyses using complete data. Inequalities in initiation widened and then narrowed over the study period, while inequalities in escalation remained stable. Inequalities in initiation impacted more than did inequalities in escalation on inequalities in daily smoking by age 15. Associations with SEP were examined for each smoking transition without conflation from differential rates at prior transitions.11 The results concur with research suggesting inequalities in initiation and daily smoking,6 but suggest that inequalities in occasional use7 may be mainly due to differential initiation which previous studies of occasional use have not adjusted for. One prior study looked at the transition from occasional to daily smoking and, in contrast to these findings, did not find an association with a proxy indicator of low income.11 This may be due to a different context (USA), or because the SEP measurement was less robust. Similar associations were observed across multiple measures of SEP here, adding strength to the findings. The period of this study coincided with strengthening TC measures in the UK. While changes in adolescent smoking development cannot be directly attributed to these measures, our findings suggest that the strength of population TC may impact on adolescent smoking transitions. More formal efforts to score UK TC policy implementation over time indicate a non-linear increase in TC scores from 2002 to 2010, with the scores being particularly high after the implementation of smoking bans in 2007.13 This corresponds well with the non-linear period effects observed here; declines in smoking risk were sharpest towards the end of the study period. Many of these TC policies, such as tax increases or bans on smoking in public places, may have been more relevant to older smokers who would have been more likely than young adolescents to purchase cigarettes themselves,17 or to smoke in bars, clubs etc. However, since rates of initiation, experimentation and escalation declined over this period, while quitting rates increased, the overall strengthening of TC measures appears to have had a health-promoting effect among younger people. Declines in initiation and particularly escalation were most notable among older adolescents. Such declines were less pronounced in younger adolescents. This pattern may indicate that additional measures—such as the adoption of plain packaging23 ,24—may be more relevant for reducing smoking development in this age group. While early adolescent uptake declined in the latter part of the study period, socioeconomic inequalities persisted and were most notable for the initiation and escalation of smoking. Reducing initiation and escalation among less advantaged adolescents has the potential to reduce inequalities in daily smoking by age 15, with potential reductions appearing greatest for smoking initiation. Initiation made particularly strong contributions to inequalities as overall prevalence declined in the latter part of the study period. Modelling suggested that tackling inequalities in initiation could have the most impact at very young ages (11–13), while efforts to tackle inequalities in escalation would have the most impact at ages 14–15. While this study examined adolescent smoking development in an environment with strong TC measures, temporal changes in adolescent smoking transitions cannot be attributed to specific TC measures. There is a need for further research to identify the most effective policies for reducing smoking uptake—particularly for less advantaged adolescents—in this age group. The relative stability over time of inequalities in escalation compared with initiation suggests different processes, which could be explored further. For example, young people in a disadvantaged SEP may learn different cultural and behavioural norms and face more persistent structural disadvantages and stressors than their more advantaged peers. While differences in cultural and behavioural norms may stem from structural disadvantages, they may be less stable over time. If these are more important for initiation, and stress and disadvantage are more important for escalation, this may explain why inequalities in initiation showed less stability in this study. A mechanism particularly worthy of further exploration is parental smoking. Young people of disadvantaged SEP are more likely to have parents who smoke,1 and TC policies may have impacted over time on adult smoking rates, including those of parents. Parental smoking can influence adolescent smoking and is therefore a potential pathway between SEP or time period and smoking risk. It was not adjusted for here as this could mask overall associations with these variables. During a period of strengthening TC in the UK, adolescents aged 11–15 have become less likely to start smoking, or progress to occasional or daily smoking, and more likely to quit if they do start. Socioeconomic inequalities in rates of initiation and escalation to daily smoking remain. While such inequalities have persisted as TC in the four countries of the UK has strengthened, they do not appear to have increased. Further research is needed to examine the impacts of specific TC measures on adolescent smoking development. At the same time that tobacco control in the UK increased, early adolescent smoking initiation, experimentation and escalation reduced and quitting increased, though decreasing risks of initiation were least likely among the youngest adolescents. Socioeconomic inequalities in adolescent uptake persist despite the overall healthy trends and are strongest for smoking initiation and for escalation from occasional to daily smoking. Inequalities in daily smoking at age 15 may be more effectively reduced by tackling inequalities in initiation at earlier ages than by tackling inequalities in escalation. The authors are grateful to the Institute for Social and Economic Research, University of Essex for collecting the data and to the UK Data Archive for making them available.
. Social patterning of individual health behaviours: the case of cigarette smoking. In: Marmot M, Wilkinson RG, eds. Social determinants of health. New York: Oxford University Press, 2006:224–37.
. Impact of tobacco control interventions on socioeconomic inequalities in smoking: review of the evidence. Tob Control ;2014;23:e8997.
. Socioeconomic position and adolescent trajectories in smoking, drinking, and psychiatric distress. J Adolesc Health 2013;53:202–8.
. Socioeconomic status over the life course and stages of cigarette use: initiation, regular use, and cessation. J Epidemiol Community Health 2003;57:802–8.
. Middle childhood antecedents to progressions in male adolescent substance Use: an ecological analysis of risk and protection. J Adolesc Res 1999;14:175–205.
. Changes in smoking behaviors from late childhood to adolescence: insights from the Canadian national longitudinal survey of children and youth. Health Psychol 2007;26:232–40.
. Short term patterns of early smoking acquisition. Tob Control 2004;13:251–7.
. Youth tobacco use: risks, patterns, and control. In: Orleans CT, Slade J, eds. Nicotine addiction: principles and management. Oxford: Oxford University Press, 1993:367–9.
. Individual and social influences on progression to daily smoking during adolescence. Pediatrics 2009;124:895–902.
. Effectiveness of tobacco control television advertising in changing tobacco use in England: a population-based cross-sectional study. Addiction 2014;109:986–94. Key dates in the history of anti-tobacco campaigning. Action on Smoking and Health. http://www.ash.org.uk/files/documents/ASH_741.pdf (accessed 14 Feb 2014).
. The Effects of Increasing Tobacco Taxation: A Cost Benefit and Public Finances Analysis. Action on Smoking and Health, 2010. http://www.ash.org.uk/tax/analysis (accessed 14 Feb 2014).
. Smoking, stigma and social class. J Soc Policy 2012;41:83–99.
. Young people's access to tobacco, alcohol, and other drugs. BMJ 2005;331:393–6. University of Essex. Institute for social and economic research. British household panel survey: waves 1–18, 1991–2009. Colchester, Essex: UK Data Archive, 2010.
. Quality profile: British household panel survey. Version 2.0: waves 1 to 13: 1991–2003. Colchester: Institute for Social & Economic Research, 2006.
. Mplus user's guide. 7th edn. Los Angeles, CA: Muthén & Muthén, 1998–2012.
. Young people's perceptions of cigarette packaging and plain packaging: an online survey. Nicotine Tob Res 2012;14:98–105.
. Adolescents’ perceptions of cigarette brand image: does plain packaging make a difference? J Adolesc Health 2010;46:385–92. Contributors MJG conceived and designed the study, performed the analysis and drafted the manuscript. All authors contributed in the interpretation of data and critically revising the manuscript, and all authors approved the final version. Funding MJG was supported by the Chief Scientist Office (CSO) of the Scottish Government Health Directorates, grant number DTF/11/16. AHL was core funded by the Medical Research Council (MRC; MC_UU_12017/5) and the CSO (SPHSU2). HS was core funded by the MRC (MC_UU_12017/3). MB was funded by the University of Essex and the UK Economic and Social Research Council. Competing interests AHL has received grants from NHMRC (Australia), the Scottish Government, the European Union, the National Institute of Health Research (NIHR) and the UK Economic and Social Research Council (ESRC) within the past 3 years. HS chairs the ASH Scotland Scottish Tobacco Control Alliance Research Group and is a member of the ASH Scotland Policy and Development sub-committee. Data sharing statement The data used in this article are publicly available at: http://discover.ukdataservice.ac.uk/series/?sn=200005.